Wednesday April 24th 1895 I hurried through with the work this morning and Will and I went to town. In the afternoon he helped me wash. I took of a few more chickens today and set more hens. I was very tired when night came. Thursday April 25th 1895 I baked bread, churned and swept some today. It was three oclock in the afternoon when the work was done. I then sat down and worked till nearly six to cut out some rags for mats. Some of them were Robs old clothes I brought from home a year ago. The Hedges boys came out to dig the well. Will helps. Friday April 26th 1895 I ironed this forenoon besides doing the other work. In the afternoon I drove "Belle" down to Ida Andersons. I did my evening work. It was late when we had supper. Miss Linder went home tonight. 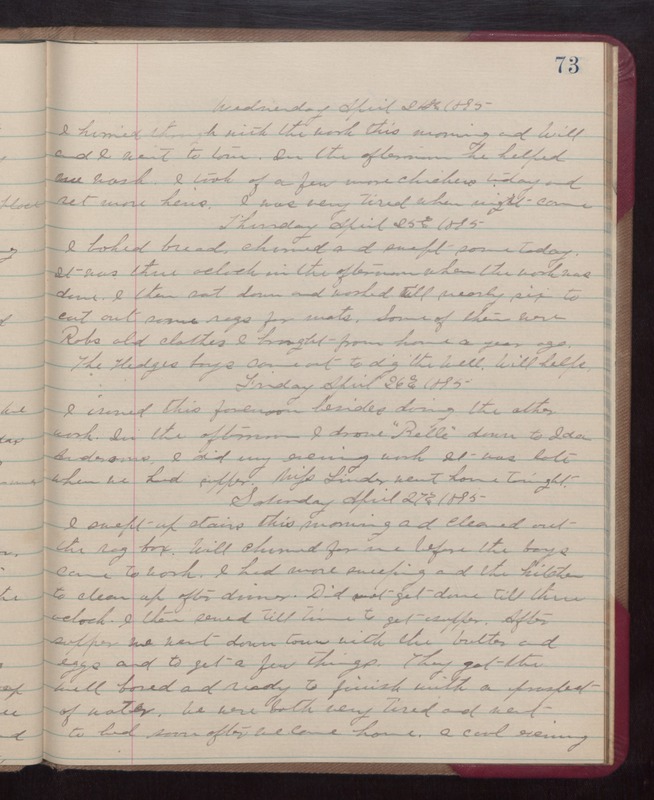 Saturday April 27th 1895 I swept up stairs this morning and cleaned out the rag box. Will churned for me before the boys came to work. I had more sweeping and the kitchen to clean up after dinner. Did not get done till three oclock. I then sewed till time to get supper. After supper we went down town with the butter and eggs and to get a few things. They got the well bored and ready to finish with a prospect of water. We were both very tired and went to bed soon after we came home. a cool evening.